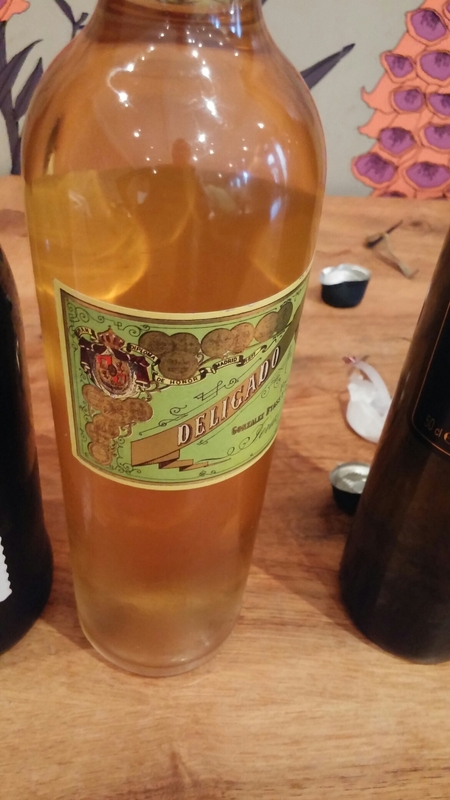 I have always been a fan of sherry, which I regard as one of the great white wines of the World and certainly one that currently offers one of the best bangs for your buck. This interest had developed massively since visiting Jerez and interacting (God bless you Twitter) with self avowed sherry nuts like @undertheflor and meeting people like @criadera of Sherry Boutique, Owen Morgan of Bar 44 in Cardiff, Penarth and Cowbridge and producers like Rocio and Alonso Ruiz of Bodegas Mons Urium (the latter, lovely people, whom I had the pleasure of meeting at a glorious tasting of wines straight from the cask in their Bodega in Jerez). These people’s total love (dare I say obsession) for sherry is truly infectious and I am now very much a sherry nut. 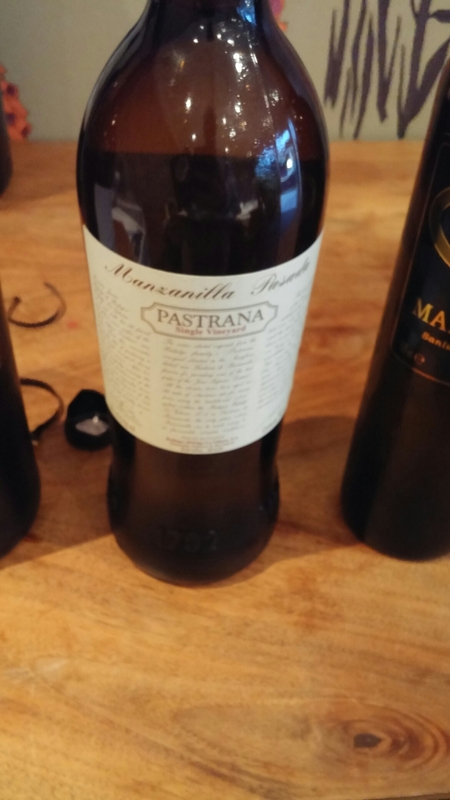 As a result a tasting in Bristol, run by the fine wine society that is the Jeroboam Club, of biologically aged sherries (manzanillas and finos) held huge interest to me. I am a very poor attendee of this club’s events (more fool me), but I wasn’t going to miss this one. Members of the club may well disagree with my tasting notes, with there being much debate as to whether fruity was a valid description of certain of the wines tasted. I thought it was many others disagreed, but that is the beauty of a tasting as everyone has their own palate (most at the club undeniably better than mine though). With the wines we have a selection of tapas bought from Ultracomida (coming to Cardiff soon in the form of the Curado Bar) by a member. These included some stunning olives, almonds, lomo, manchego and a very superior Iberico jamon. All perfect with the wines. On the price front whilst a number of the wines were sourced wholesale or directly from the bodegas, I have where possible given the retail price in the UK. With the biological ageing process, sherry casks are not filled to the top with a layer of yeasts, referred to in the post title (excuse the terrible pun – Marvel comic fans will know what I mean) as “the fantastic flor” (also known as the velo de flor), developing atop the base wine in the cask. This results in wonderous wines, with the flor both protecting the wine from the oxidising effects of exposure to air (as would otherwise occur with the casks being not filled to the top) and interacting with /feeding off the wine as it ages and is refreshed with younger wines. The time the wine ages under the flor and the nature of the flor itself dictates its character, as does the skill of the producer in operating the solera system and refreshing the wine in the casks. Oddly despite some sherries being “under the flor” all sherries are (unlike most other wines) aged above ground. 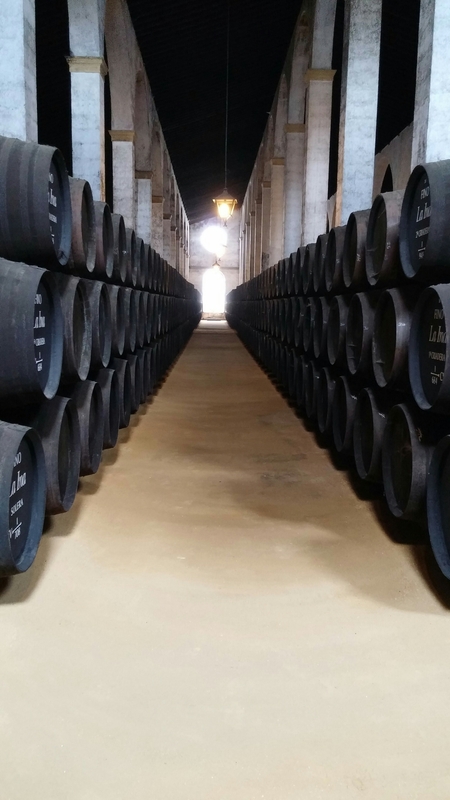 Manzanillas and fino are made pretty much the same way, remaining always under flor in the cask (other types of sherry are only under for part of their aging or not at all). 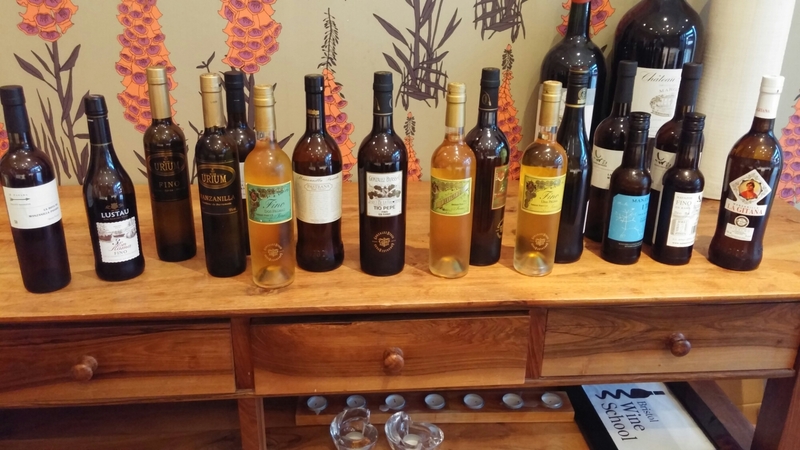 They are, however, distinct wines due to various reasons not least the thicker covering of flor that tends to develop in the higher humidity and more constant temperatures found in Sanlucar de Barrameda (legally Manzanilla can only come from Sanlucar) as against the non maritime climate in Jerez. 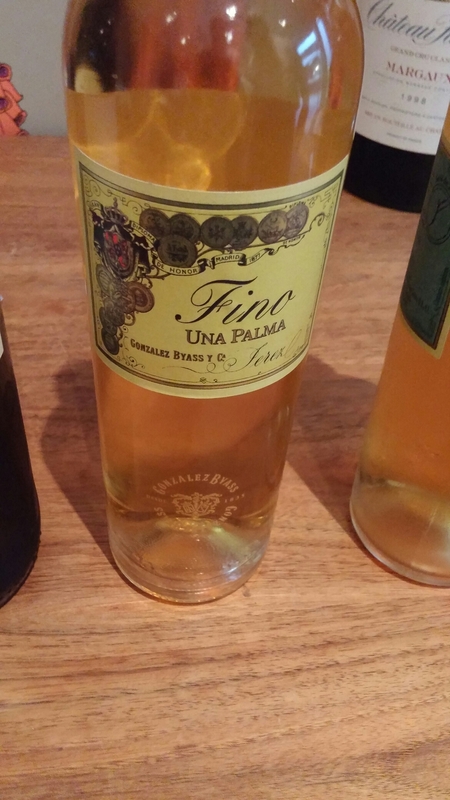 Fino wines are also produced in El Puerto de Santa Maria which has a similar maritime climate to Sanlucar and finos produced there are different on the nose and the palate as against Jerez finos. This is not the only differences, but that is enough of the geeky technical stuff methinks. Before I get to the wines, a number tasted were “en rama”. For the sherry novice, this can be taken to mean in the raw and operates supposedly as a counterpoint to the accepted norm of the more commercial finos and manzanillas being heavily filtered and clarified so as get rid of the flor. En rama is in theory straight from the cask – in reality it is stuff subject to minimal or no filtration. There is now a big deal (heavily promoted by the big boys like Gonzalez Byass) on the release each year of en rama wines. Anything that raises the profile of sherry must be a good thing, but this is something a lot of the smaller producers do anyway. So to the main event and (as always with the Jeroboam Club) we had an enviable selection of excellent and varied wines to taste covering all three towns that make up the ” Sherry Triangle” (Jerez de la Frontera, Sanlucar de Barrameda and El Puerto de Santa Maria). A perenial favourite this one. With its distinct “Gypsy woman” label, it is one of the most recognisable and widely available sherries worldwide. A good starting point for stepping into the world of sherry, it is very pale and bone dry. On the nose there was olive brine and hints of citrus, with a seaside saltiness on the palate. Only the merest touch of the yeasty flor here on the palate. Very quaffable and lovely as an apéritif anytime. Fabulous value for money and a perfect example of how good sherry can be even at the entry level. It is fair to say that Equipo Navazos do things a bit differently and boy does it show in this wine. The contrast in colour as against the La Gitana is extraordinary. The colour of this makes it look like it has had some exposure to oxygen and this I understand is a result of the unique way Equipo Navazos stuff is made, with the fill in the cask much higher than is common practice. 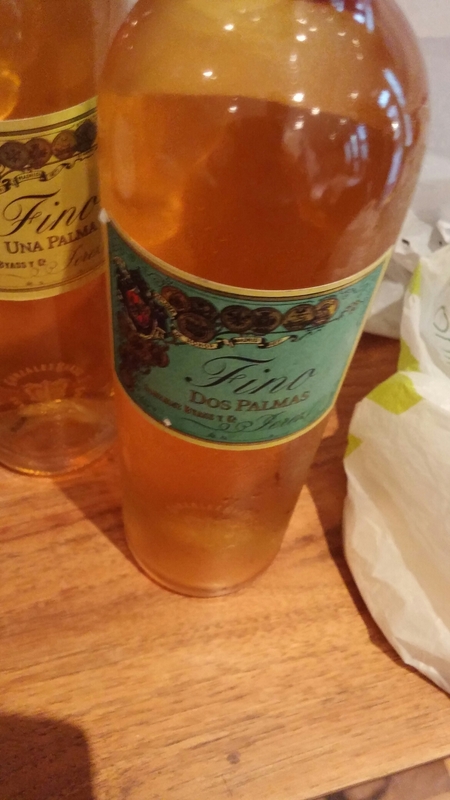 This, and the fact that the average age of the wine in it is 6-7 years (standard manzanilla is usually only an average of 3 – 4 years old) and refreshment rates ( an amount of the wine in the cask being extracted from the cask and replaced with a younger wine as part of the solera system) are the bare minimum to keep the flor alive, means the flor remains very thin and offers less protection than is normal. 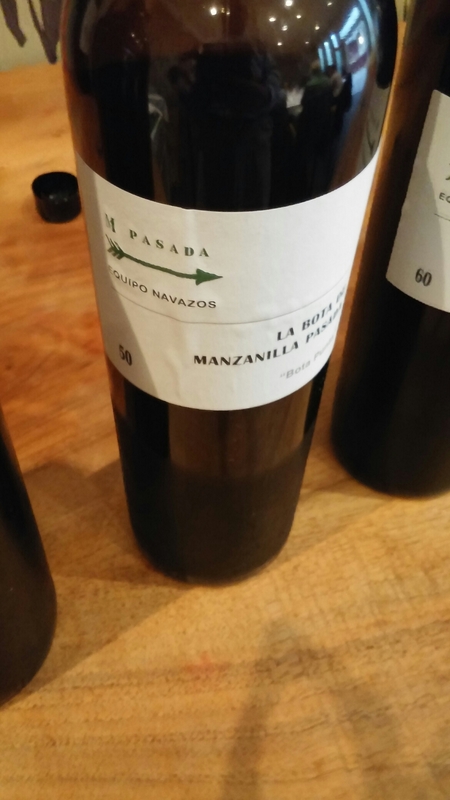 Arguably it is a manzanilla pasada edging towards a manzanilla amontillado (a point of much debate during the evening) . Golden in colour, it has a real smack of olive brine on the nose. Very intense aromas from this. On the palate there is a lovely sharp tang of saltiness (that taste by the sea on a windy day), with nuts, bread and green apples thrown into the mix. Beautifully complex wine which would be sensational with gambas de Sanlucar. A lot more oomph to this wine (both on the nose and the palate) as against the standard La Gitana, but still a lot lighter in colour and less robust in flavour than the La Bota 55. On the nose there is that characteristic manzanilla aroma of camomile (manzanilla is the Spanish word for camomile), salt and iodine. It is much less salty in aroma than the La Bota 55. On the palate it has yeast and elements of fruit, together with some slight bitter notes. Nice long finish on this wine. 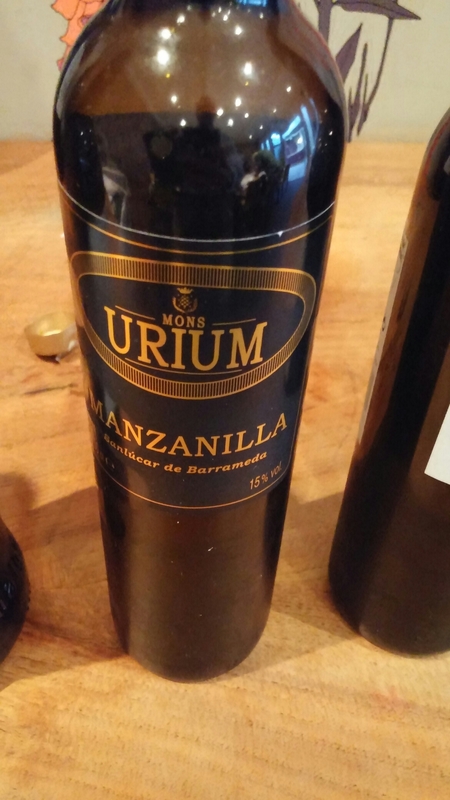 Bodegas Mons Urium (Sherry Boutique – £19.99 – 50cl). Aged a little longer than average (for a pasada) at 8 -10 years, it is a straw colour. Despite its age it retains a youthful zippiness whilst still being rich. A step up from the Higaldo Pastrana there is yeast, dried herbs, camomile and nuts on the nose. On the palate it is oh so very easy to drink (dangerously so) with a touch of fruit and saline and a very dry persistent finish. It begs you to open another bottle as the first one rapidly disappears down the hatch. 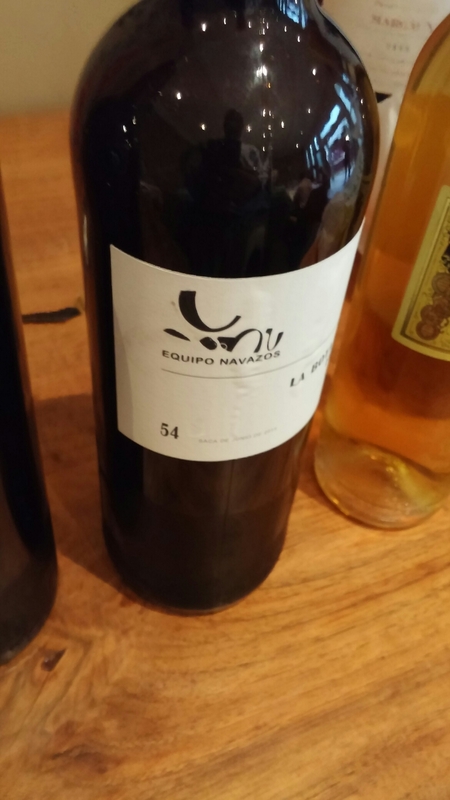 Again this Equipo Navazos wine is something quite different, with its average age at around 15 years (far older than any other manzanilla pasada I have previously tasted) with an unusually high fill of the cask and a low refreshment rates as against the accepted norm. A rich golden colour, it looks (and indeed tastes) nothing like the other two pasadas. On the nose there is a lot of saltiness and iodine. On the palate you can get the fact that it is 16.2° (a touch higher than most manzanillas), but it has almost stone fruit notes to it – apricot I would say – as well as toasted nuts. 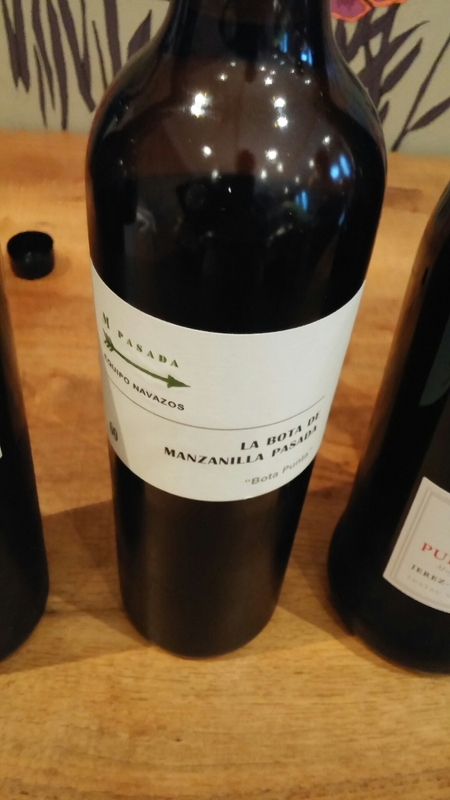 As with the other La Bota wines there were signs of near oxidisation to this wine which seemed to be moving towards a manzanilla amontillado to me. Lovely stuff mind regardless of what it is. Sensational with the Iberico jamon. Very similar this to the La Bota 50. A lovely rich golden almost bronzed colour and the same seaside notes, with toasted nuts and stone fruit flavours in the background. This wine, however, seemed to me to integrate that extra alcohol (again over 16°) just a smidgen better than the La Bota 50. As a result, I thought this had a smoother finish and it was my slight favourite of these two truly lovely manzanillas. First and only dud of the night (sourced via Amazon). I have tasted this wine many times before and it has a lovely iodine and ozone character to it normally, but this stunk of burnt rubber. Horrid and I have to seriously wonder how this bottle was stored by Amazon. Very disappointing as this is a good wine from a good producer. 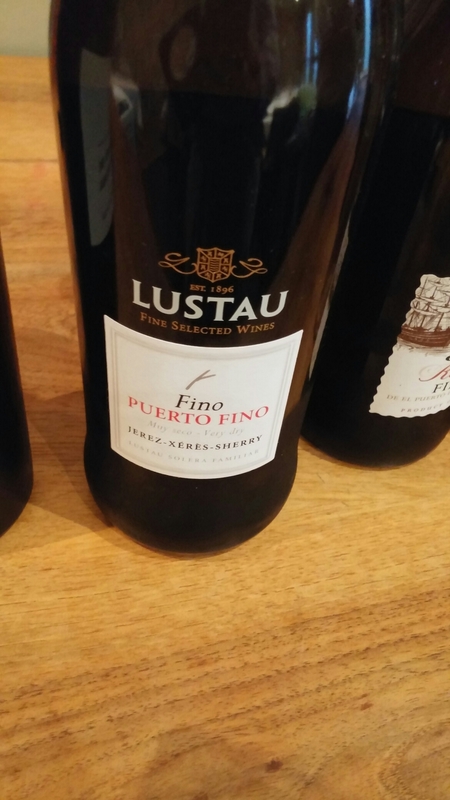 Lustau make a very acceptable alternative for Waitrose, which at £9.99 for a 75cl bottle is excellent value. Much more like it this and a proper representation of what a Fino del Puerto should be like. Part of an “en rama” trio offering from Lustau covering the three “Sherry Triangle” towns, many argue this is the best of the three. Nice aromas and taste of seaside iodine and ozone which comes with a brisk breeze blowing of the sea and waves crashing onto the shore line. Perfect to drink on its own, with seafood or tapas. This is a very quaffable wine. First up on the fino front was a very affable number produced exclusively for Waitrose in the UK by the wine behemoth that is Gonzalez Byass (GB). Whilst a massive company, that has its fingers in many pies well beyond Jerez, GB’s sherries exude quality from the entry level up. 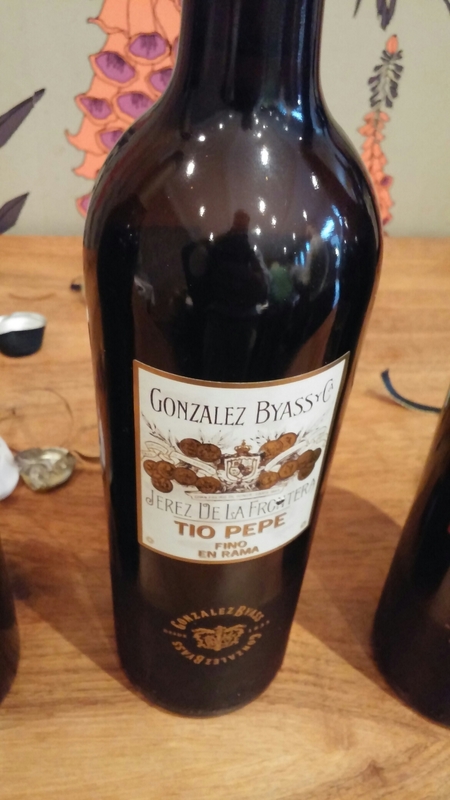 Their Tio Pepe is instantly recognisable and is the sherry most likely to be found in UK pubs and restaurants (which with notable exemptions, like Bar 44, tend to over look sherry). 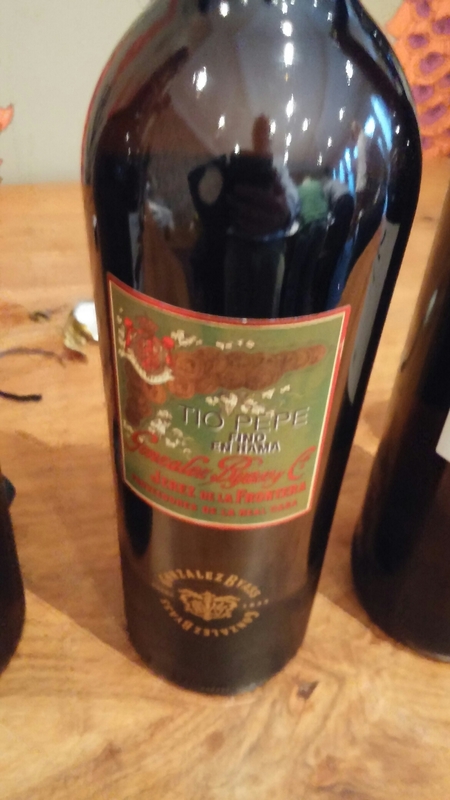 For the price (retail around £8 in UK) Tio Pepe is, however, excellent stuff. This Delicado is a step up from Tio Pepe and has a pleasant straw hue to it. On the nose there is bready yeast and almonds. On the palate there is again bread and almonds, with a pleasant tanginess as it persists on the tongue. Perceived wisdom (well the advice from the marketing bods) is en rama sherries need to be drunk within 6 months of release as the lack of filtration makes the wines unstable. As such, in theory, this should have been potentially over the hill. Definitely not the case in my view and I actually preferred it to the 2016 release (below). Lots of bready notes as well as stone fruit on the nose and a bit of salt. On the palate it had a nice citrus and salt tang as well as almonds. There is also a nice fruitiness to it. Very pleasant and showing no sign of being on the way out. The latest release and thus, in theory, it should be better than the 2015 (if you believe what they say about en rama). On the nose it is similar to the 2015, with seaside saltiness and citrus. On the palate it again mirrored the 2016, but lacked the fruitiness of the 2015. Nice, but I preferred the 2015. Straw coloured with lovely aromas of almonds and herbs here, together with a nice breadiness and citrus notes. On the palate it is beautifully smooth (and like their manzanilla dangerously easy to drink) and there are bags of nuts (almonds) in it. It also has nice savoury and citrus notes to it. A lovely match for the olives and jamon this and a great wine with all sorts of food. A lovely drop this and one I could happily drink all day and every day. I may be bias, (as I have met the producers at the bodega and drunk the stuff straight from the cask), but this is one of my favourite fino sherries. Well worth hunting down, with Sherry Boutique the only place I know of to get it (and other Mons Urium delights) retail in the UK. Another pearler of a wine from Equipo Navazos and one that differed markedly from the other finos tasted. A very rich, deep golden hue with a briney nose, plus iodine and almonds. On the palate the yeasty flor came to the fore as did a lovely rounded fruitness and just a hint of salted caramel. It went stunningly well with the Iberico jamon. Classy stuff and a good price for a Equipo Navazos wine. Not as rich in colour as the La Bota 54, but a pleasant sun baked straw. On the nose it had apples and a touch of nutty sweetness. In the mouth, I got salted almonds. Very pleasant drop for the price. Moving up a gear from the Una Palma, the average age of the wine in here is 8 years (it is 6 in the Una) and it is a more complex wine. The nose is quite medicinal in character with lots of iodine. On the palate it is briney, with a hazelnut and citrus finish. Lovely stuff and again good value for the price. A wonderful tasting that was enlightening in many respects, not least how different these sherries can be. Bar from the dud Lustau puerto fino (the en rama was lovely) every wine was excellent and showed the quality of sherry across the board from entry level and upwards. This was my first time tasting Equipo Navazos wines and it won’t be the last (although not cheap, so will be treat rather than regular drinking). Deliciously different stuff. The La Gitana is great as a quaffer and superb value for the price and all the GB wines showed well and were very fairly priced. 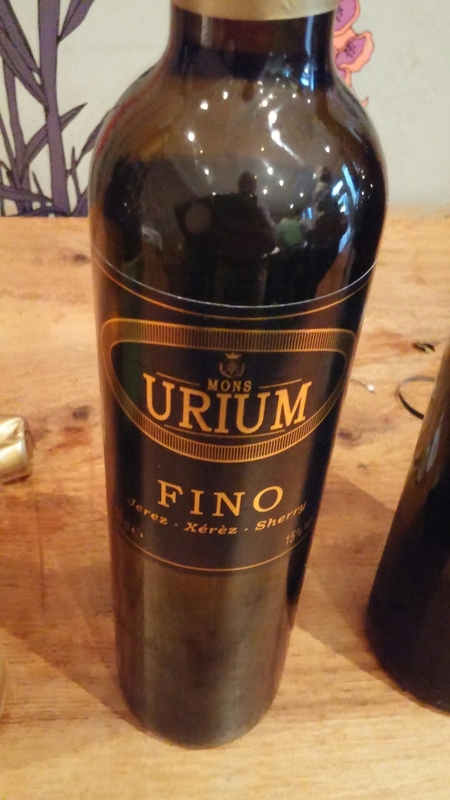 As for the Mons Urium’s wines, lovely stuff made by lovely people. 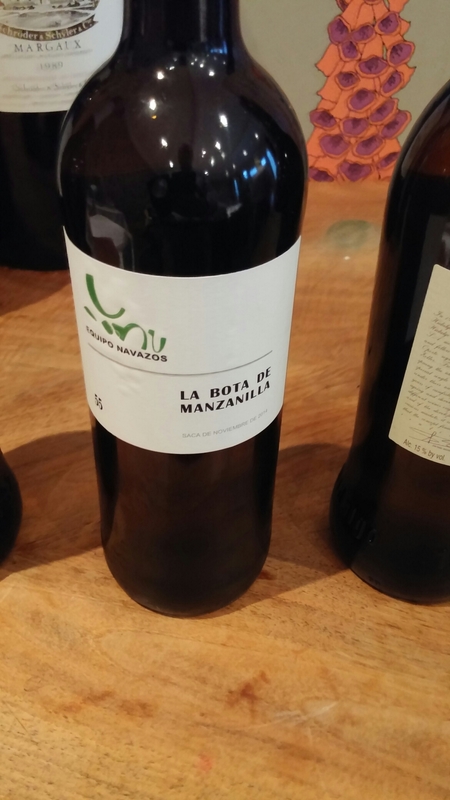 For readers in the Cardiff area, Bar 44 has an excellent selection of finos and manzanillas on its list (as well as other sherries) and fab food to go with them. They have just added a couple of Urium wines (oxidatively rather than biologically aged) to their list. Well worth a look is my advice, as classy stuff. Can we have their fino and manzanilla (on top of the lovely ones you do already) please too? 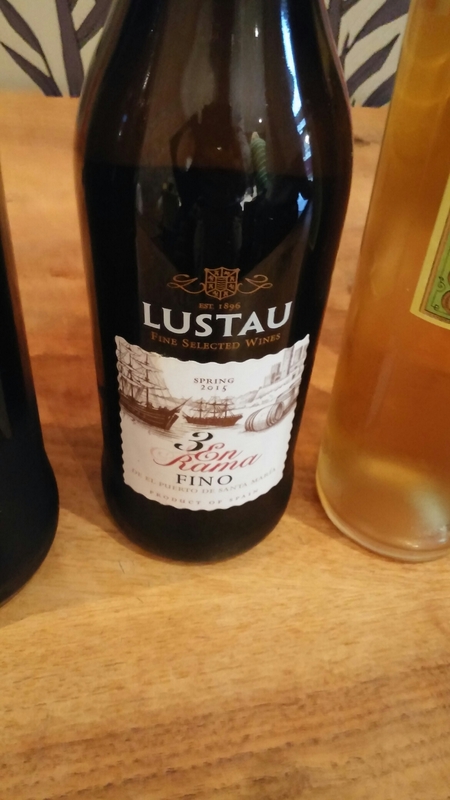 This entry was posted on Jul 24, 2016 by solicitingflavours in Bar 44, Bodegas Urium, Equipo Navazos, fino, Gonzalez Byass, International Sherry Week, Jerez, Lustau, manzanilla, Puerto de Santa Maria, Sanlucar de Barrameda, Sherry, Sherry Boutique, Spain, Spanish wine, Tapas, Tapas bar, Urium, White wine, wine.